It’s the day after tax filings are due, and that means one thing: 4SQ Day! Actually, the timing of 4SQ Day has nothing to do with a post-tax-filing celebration. The date (4/16) is four squared. Swarms of Foursquare users are planning to meet in Boston, Chicago, Detroit, Miami, and even London. About 150 businesses and counting across the country and a few in Europe are celebrating by giving Foursquare users special one-day deals and there is even a new badge. Even McDonald’s is getting involved. Sounds like another quirky marketing stunt by Foursquare, the geo-social startup that gives you points and prestige (okay, badges) to check in everywhere. 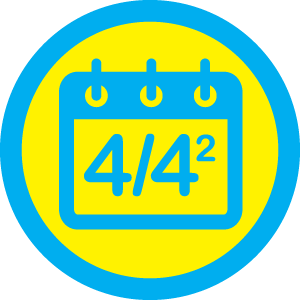 But Foursquare has almost nothing to do with 4SQ Day other than making the badge. CEO Dennis Crowley tells me that it wasn’t organized by Foursquare at all. An independent group of users led by Tampa Bay optometrist Nata Bonilla-Warford organized the event and it sort of grew on its own. Local businesses are getting in on the self-described “social media holiday” by adding special promotions to be part of the one-day event. Crowley compares it to some of the early Tweetups or other self-organizing activities of Twitter users when it was at a similar size. When the users take over, that is a good thing.